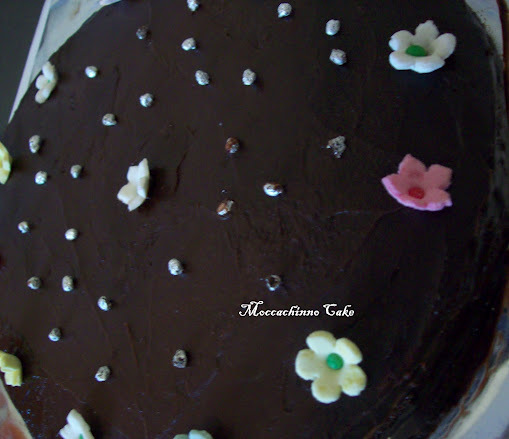 A rich, dense & moist Moccachino cake infused with rich espresso coffee flavor, with chocolate icing. I made this cake as teatime snack for My family friends. 1. Sieve Maida, baking powder, cinnoman cocoa and coffee powder twice for even mixing and keep aside. 2. In a mixing bowl, add milk, vanilla essence, butter, sugar, condensed milk and mix well until sugar completely dissolves. Now add the sieved Maida mixture little by little and mix well until a creamy batter without lumps is formed. 3. Preheat oven at 180 deg C. Grease the baking tin with butter and maida, tap the excess flour, pour the batter in the tin such that the batter is more than 1/2 or close to 3/4th of the tin and bake it for 15 to 20 mins. 4. Insert a fork in the middle of the cake to check if the cake is done. If it comes out clean then your cake is ready. 5. Allow it to cool for 10mins then invert the tin, the cake will demould itself perfectly. 1. Melt the butter in a large saucepan. Add the sugar, and bring to a boil. 2. Turn the heat to low, add cocoa and continue boiling for 2 minutes, stirring constantly. 3. Add milk very slowly, being careful not to splatter. Bring to a boil, stirring constantly. Remove from burner and cool to lukewarm. 4. Using a stand mixer at medium speed, slowly add confectioners' sugar 1 cup at a time, beating after each addition. Beat until frosting reaches desired spreading and/or piping consistency. Add more milk a little at a time if the frosting is too thick. Add more confectioners' sugar if the frosting is too thin. Cut the cake into two and soak with sugar syrup. Spread a bit of chocolate frosting on a flat, round, decorative serving plate. Place one round cake layer on top of the frosting and press lightly. Spread a thick coat of frosting over this layer and place the second layer on top, pressing down lightly to seal. Spoon approximately 1 cup of frosting in a pastry bag fitted with a medium size star tip and set aside. Frost the sides and top of cake using an off-set spatula, making sure to seal all edges evenly. Decorate with crushed Walnuts/Cashew/Badam or Pipe rosettes over top of cake. (Or pipe alternating dollops of coffee and plain cream using zip bags. Refrigerate until serving. •Add instant coffee to the frosting, and decorate for an all mocha flavor. •Omit the coffee and add white and/or dark chocolate chips to the batter. •The coffee and coco flavor compliments each other so well. •Try adding a 1/2 teaspoon ground cinnamon for flavour. •It is a teatime snack cake so it is mildy sweet. You can increase the sugar if you want the cake to taste like the regular cakes. Wow Akka,cake looks absolutely elegant,gorgeous and incredible..